I know it’s been a long time since I posted here – December has been busy for me! I started a new job and had to do some traveling, and I’ve been so sleepy in the evenings. 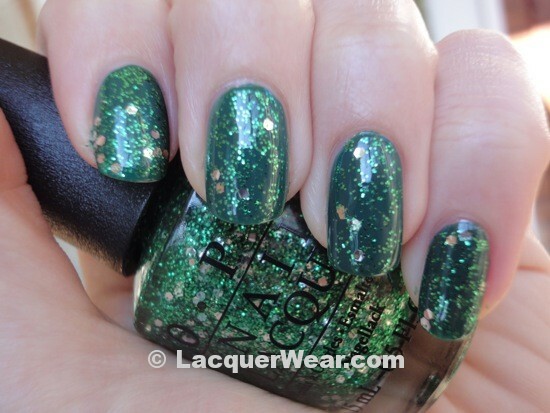 I wanted to share wishes for a happy holiday season, and also pictures of another one of the OPI Muppet glitters. When I saw the polish insomniac’s swatches of the Muppet Glitters over black, I decided to give some of the others a chance. They look so much denser and more interesting over an opaque base color! I wanted to try a base color that was close to the glitter color, though, so I have OPI’s Fresh Frog of Bel Air over Essie’s Going Incognito, from Winter 2010. I liked the formula on Fresh Frog of Bel Air – it wasn’t too thick, but the glitter went on well and only took one coat to give the coverage in my pictures. This polish is one of two polishes in the Muppets Collection that have a seemingly random Will Smith reference. I know that others have mentioned this, and I just have to agree that it’s weird. I really liked this combination – it’s very sparkly, and the glitter lightened up the overall color of Going Incognito a bit, so that it came out looking more flashy and Christmas-y. The big silver hexagonal glitters just add more shine and a scattered, twinkling feel. As a plus, it wasn’t too hard to take this off. I had two coats of Going Incognito plus another coat of clear topcoat under the glitter, so I think there was enough polish underneath it to keep the glitter from really getting stuck to my nails. In the shade you can see the little green glitter pieces more clearly. The coverage was nice for just one coat. The Muppets polishes are out now at salons, although the displays around here are looking pretty picked over by now. I’m still hoping to find a bottle of Gettin’ Miss Piggy With It (ugh, Will Smith again) somewhere.